VP, Semi-Integrated, Sealed Cartridge Bearings, Straight 1-1/8"
To run the forums, host the website, and travel, I charge a universal service fee for my reviews. This review was sponsored by Trek. 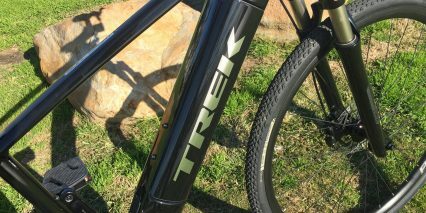 My goal is to be transparent and unbiased, this video and written review are not meant to be an endorsement of Trek products. 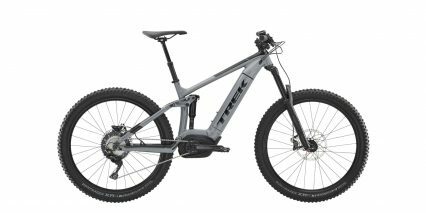 Trek completely redesigned the Dual Sport+ for 2019, swapping the Shimano E6000 drive system for a Bosch Active Line Plus. 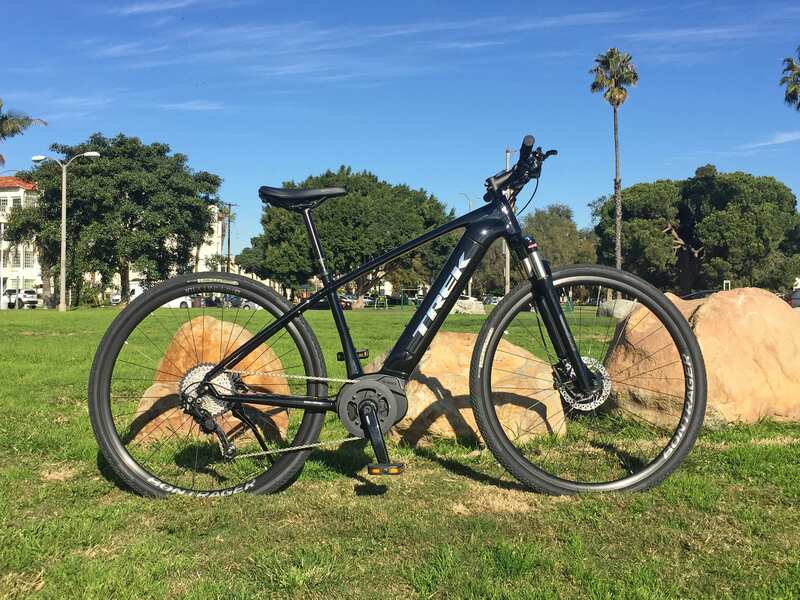 While the price increased by roughly $600, and the overall weight went up by roughly 2lbs, the bike looks better than ever and is now available in a mid-step frame style. 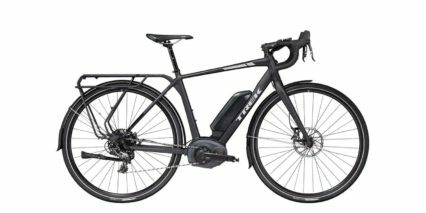 Trek labeled the mid-step as “Dual Sport+ Women’s” but it would be a great choice for anyone with hip or knee sensitivity, because the standover height is lower. I like that they chose silver for the women’s frame because it’s classy, timeless, and unisex. 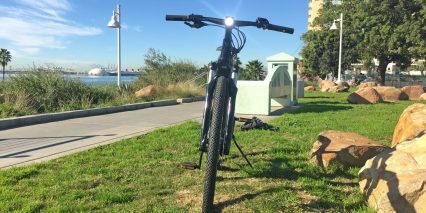 Across both frame styles, the bike is available in five sizes ranging from XS to XL, and this should ensure an excellent fit. 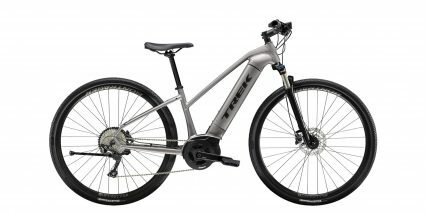 Trek is sold exclusively through dealers and has one of the largest manufacturer-owned network of shops for any bicycle company in North America right now. 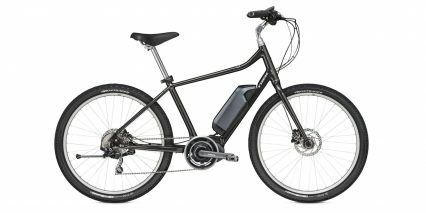 This company is a leader in providing support, developing new bicycle hardware, and I feel that the Dual Sport+ is one of the best all around electric bicycles on the market right now. It’s extremely well thought out and includes two sets of bottle cage bosses, a rear rack mount, frame lock (cafe lock) mount, fender mounts, and two very nice integrated lights. The headlight is aimable, delivers 550 lumens, and has orange side windows to keep you visible from more angles. The backlight consists of 11 LED lights! 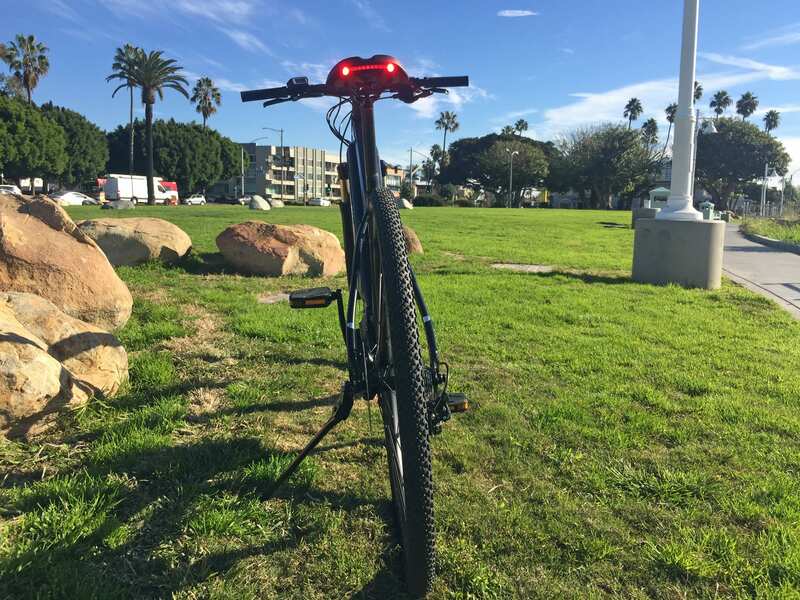 I’m used to seeing just one or two LED’s on similarly priced ebike products. That said, the rear light is built into the saddle and may be obstructed by long shirts or jackets that hang down. Furthermore, if you add a cargo rack and attach a trunk bag, this may also block the light. I believe that the Dual Sport+ is named after dual sport motorcycles, which are capable both on and off-road. 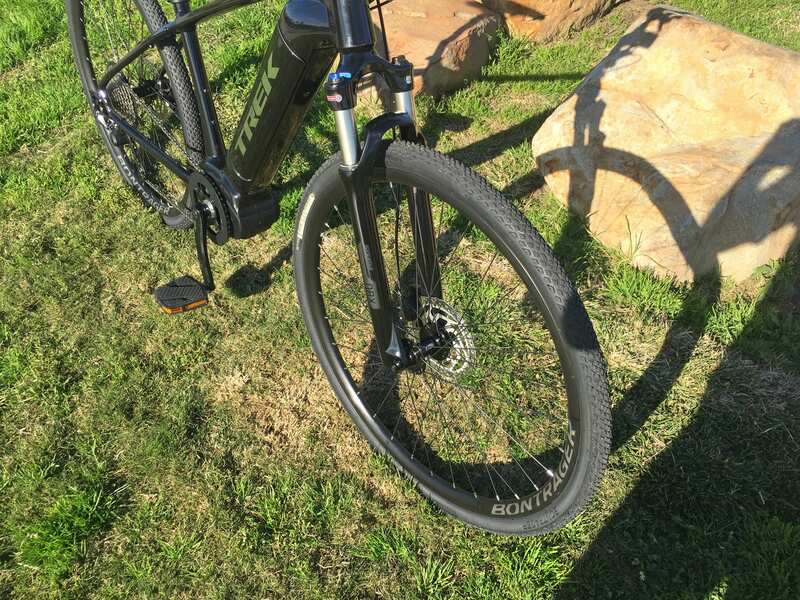 To me, this model leans a bit more towards road because the tires are fairly narrow and the suspension fork offers limited 63mm travel vs. 100mm+. 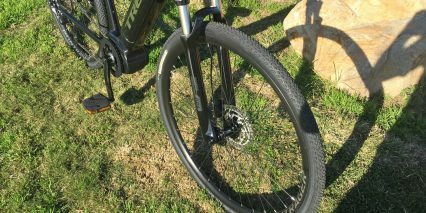 That said, the tires do offer Hard-Case puncture protection, a trail-capable tread pattern, and the fork offers compression adjust with lockout, and preload adjust. SR Suntour makes a wide range of suspension fork options, and the NRX appears to be upgraded from the common NCX. The wider 30mm stanchions appear to be anodized for reduced stiction, but they are still made from steel vs. aluminum. This is a spring fork vs. air, which means increased weight but consistent reliable action with limited service. 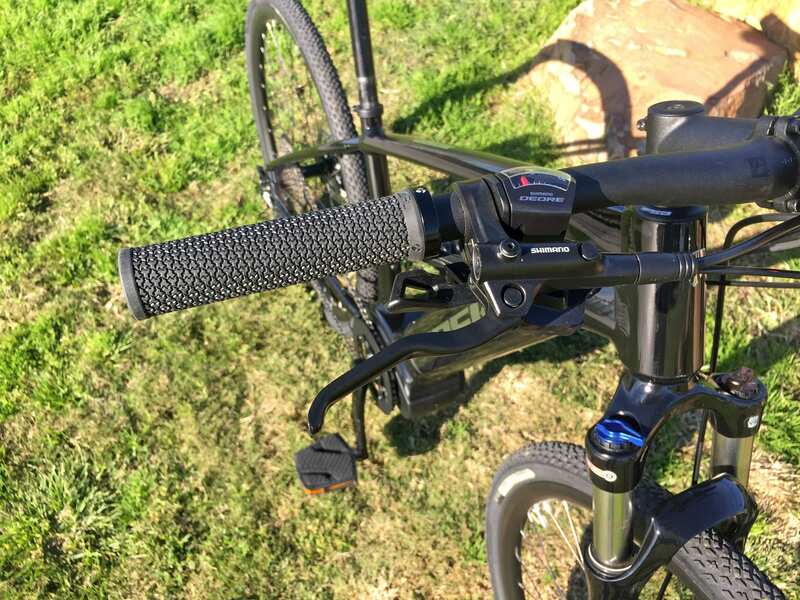 One of my favorite accessories for any hardtail electric bike is a suspension seat post, and that can be added here, but it might interrupt the saddle light because it’s wired through the stock rigid seat post. 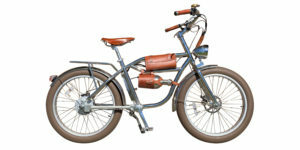 This electric bicycle is well balanced, with motor and battery weight positioned low and center on the frame. 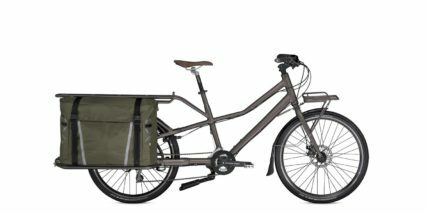 Battery integration is visually pleasing, and Trek has designed a shell casing with integrated handle for safe transport. The Shimano hydraulic disc brakes are powerful and smooth, with adjustable-reach levers for riders with small or gloved hands. 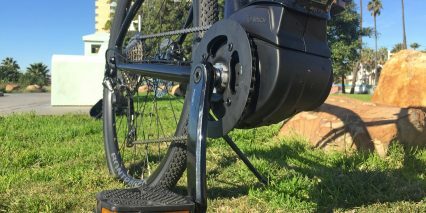 The Shimano Deore derailleur is upgraded with a one-way clutch for reduced chain bounce (just click the little gray lever into the up position or click it down for easier maintenance and wheel removal). You get a very capable 10 speed cassette with 11 to 42 toot spread, plenty for climbing slowly or topping the 20mph maximum assisted speed. And, with the Bosch Active Line Plus motor, there’s no reduction gear drag like we’ve seen on some of the sportier Performance Line motors. 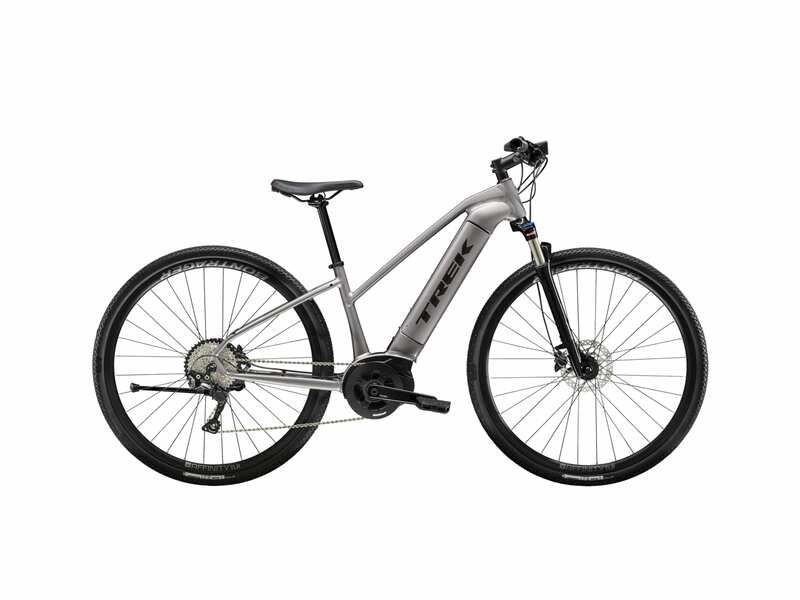 The Trek Dual Sport+ comes with a traditionally sized 38 tooth chainring, sturdy alloy guard, sealed bottom bracket with excellent cranks, and unique plastic platform pedals. 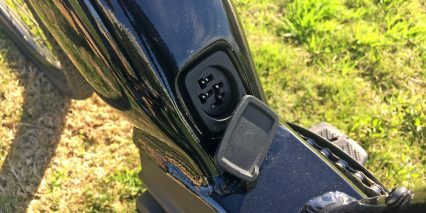 Again, you’re paying more for these little upgrades all across the bike, but they provide durability, a quieter more comfortable ride, and you’ll be supported by the dealer network. 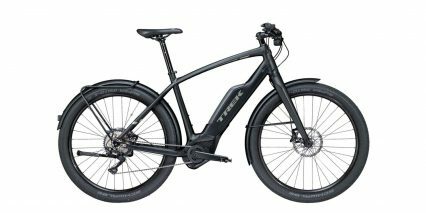 Trek is one of my favorite ebike manufacturers right now, for real. They have been easy to work with (as a reviewer) and I have been consistently impressed by their engineering decisions. Note that the new Trek Dual Sport+ Women’s replaces the older Trek Neko+ model. 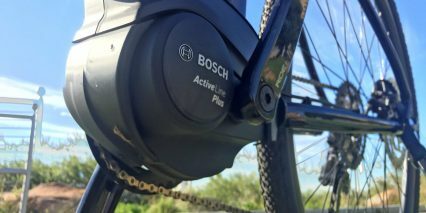 Driving this bike is an efficient planetary geared mid-motor from Bosch, called the Active Line Plus. It ranks just above the Active Line, providing a sportier feel with increased torque (50 newton meters vs. 40nm) and motor output (105 rotations per minute vs. 100 RPM). This translates to zippier starts and consistent support when downshifting for climbs. It’s not nearly as capable as the 75nm meter 120 RPM specced Bosch Performance Line CX, but it’s much quieter, lighter (71.l pounds vs. 8.8lbs), smaller, and smoother feeling. For a mostly-urban ebike like the Dual Sport+, I think it’s an excellent choice. So many competing models in this category weigh upwards of 50lbs and don’t look as clean. Notice how the motor is almost hidden behind the chainring on the Dual Sport+. 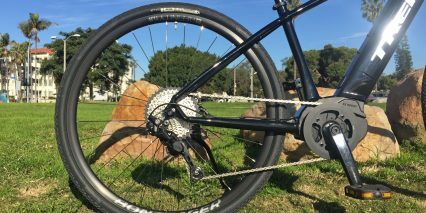 The alloy guard offers a bit of protection for your right pant leg or dress ends from the oft-dirty chain, and doubles as a bash guard for the steel chainring teeth and motor undercarriage. 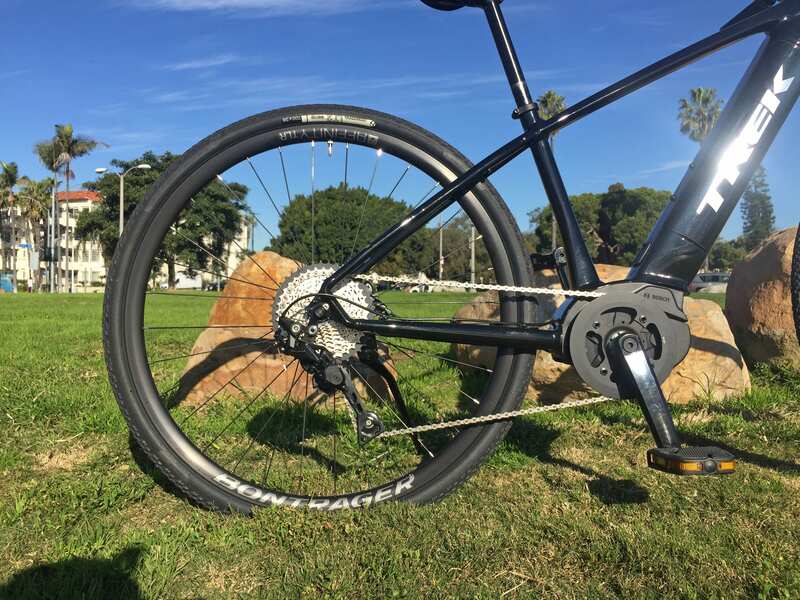 The chainring is positioned close enough to the motor casing that it should act as a guide, reducing chain drops in conjunction with the outer guard. Other notable aspects of the Active Line and Active Line Plus motors are that they can pedal backwards, actually cycling the chain through the cassette. This can be handy for servicing and lubricating the drivetrain and chain. 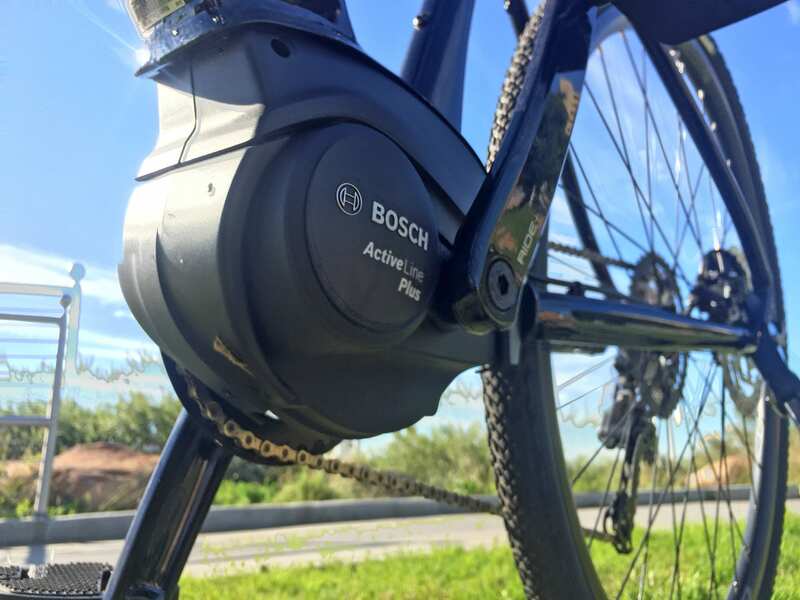 All current generation Bosch ebike mid-drive systems include an advanced motor controller that measures rear wheel speed, pedal cadence, and pedal torque over 1,000 times per second. This feedback is used in conjunction with the display panel, and chosen level of assist, to provide natural power output. 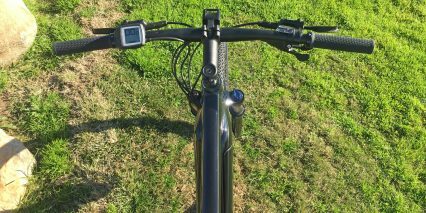 It measures your pedal stroke pressure, aiming to reduce power surge (the on/off wave feeling often associated with heavy pedaling). And, it measures sudden changes in drivetrain pressure outside of pedal strokes that indicate shifting. This is called shift detection, and the goal is to reduce motor pressure when the derailleur is redirecting the chain. Ultimately, this will reduce gear mashing and keep the teeth on your rear sprockets and chainring in better shape over the long term. In my experience, it’s still a good idea to ease off on your pedal pressure when shifting. The latest generation Bosch battery is called PowerTube and is designed to fit completely inside of bike frames. This provides physical protection, improved appearance and “stealthiness” for those who wish to fit in with traditional acoustic bicycles, and often lower weight positioning. 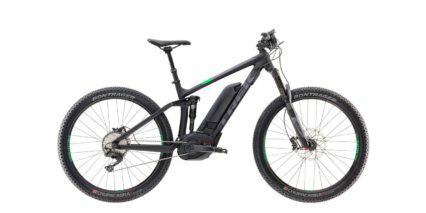 The Trek Dual Sport+ models take advantage of this battery pack and fully optimize how it interfaces with their frames. Covering the right side of the battery is a paint-matched alloy. Plastic end caps allow it to fit snugly into the downtube of the bike, with the top cap featuring a flip up handle. 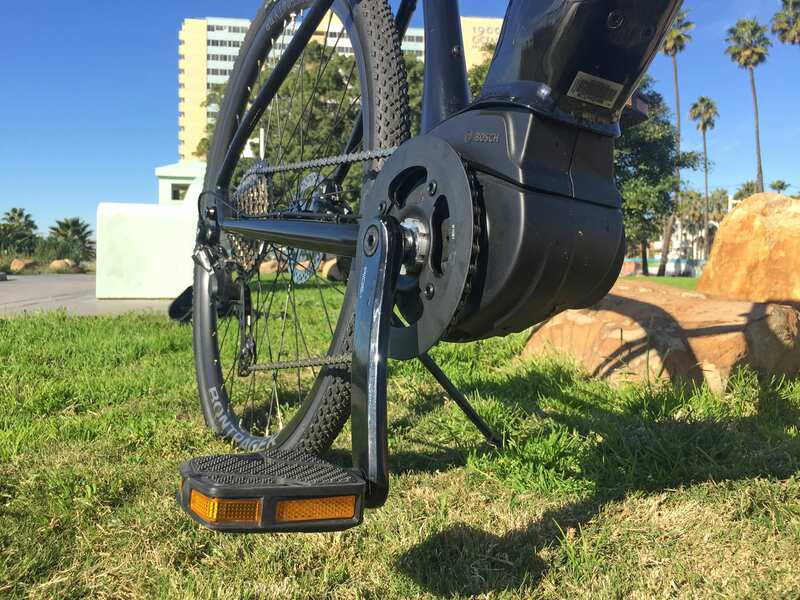 When unlocking this battery from the left side of the downtube, it springs partway out to the right side, and remains secure until you press the handle and lift out. This design ensures that the battery won’t tumble out and take damage. The locking core system that Trek has chosen is made by ABUS, and includes a Plus Code which can be used to purchase “keyed-alike” locks. That’s a big deal if you dislike clutter and appreciate time savings vs. fumbling around trying to guess which key goes to which device. As much as I do like the locking core and two-step battery removal design, I was a little disappointed to discover that you have to reinsert the key and unlock the core to reattach the battery. Most competing designs allow you to forcefully click batteries back into place. Also, the additional shielding and plastic end pieces increase the weight of the battery, going from 6.3lbs for a naked PowerTube to 7.3lbs complete. For this reason, I recommend removing the battery pack when lifting and servicing the bike. 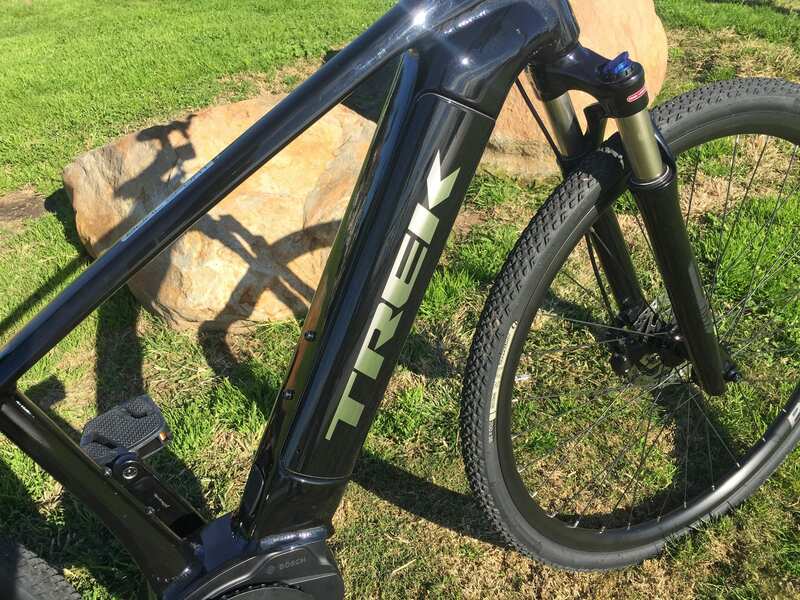 Note that Trek purposefully chose a side-mount design because it’s easier to access… and they chose the right side of the frame because it’s a best practice to always lay bicycles down on the non-drive side of the bike, thereby protecting the derailleur. For a bike like the Dual Sport+, which has a kickstand, that’s less of an issue. 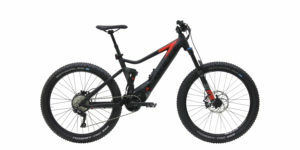 But you can see how it becomes very relevant with something like the Powerfly electric mountain bikes. And, I believe that you can swap batteries between any of the new Trek models that utilize the PowerTube, though the shield colors may not match the frame in that case. And, this is my biggest complaint over the older plastic encased PowerPack batteries. Those were always black or dark gray and could be easily swapped between bikes… they didn’t have proprietary outer casing or handle designs, there was a loop handle built right in. 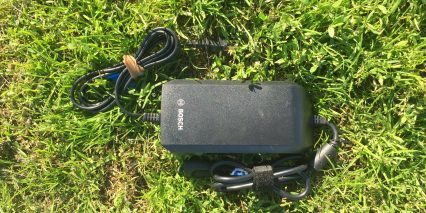 They were significantly lighter at ~5.7lbs while offering the same high capacity 482.4 watt hours. The big trade-offs were weight distribution, durability, and aesthetics. 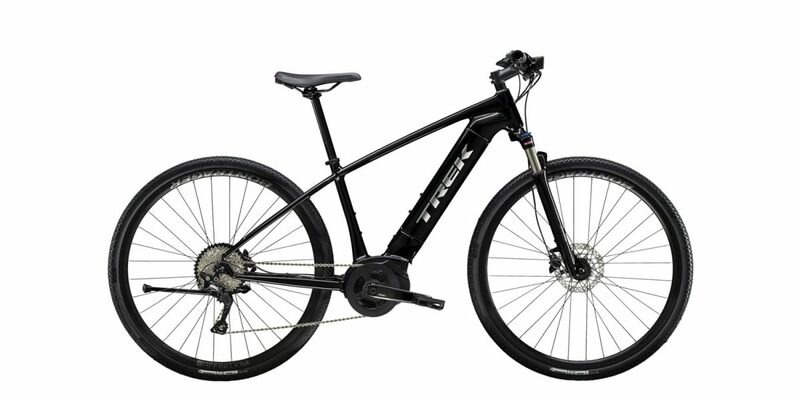 This was also the case for Trek’s older Dual Sport+ model which used an external Shimano STePs BT-E6010 battery. All things considered, I think Trek has done a great job integrating the PowerTube and I appreciate that they were able to add a pair of bottle cage bosses above it on the downtube in addition to the pair on the seat tube. 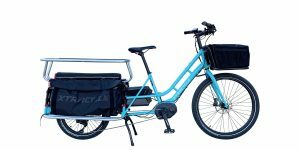 This means that you can carry a combination of folding lock, mini pump, accessory bin, and water bottle without needing a rear rack that adds weight and noise. 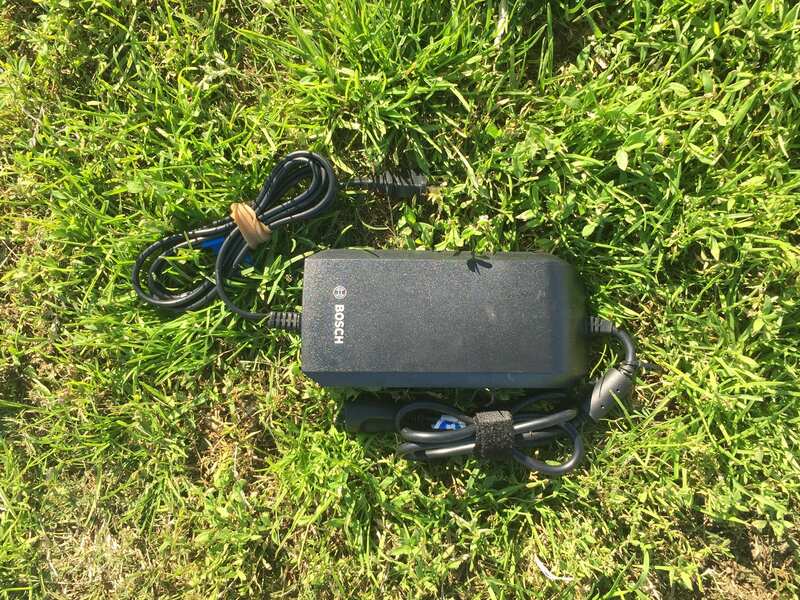 Finally, you can charge this battery on or off the bike and I’d recommend storing it in a cool dry location. Lithium-ion batteries can be sensitive to extreme temperatures and last longest when maintained between 20% and 80%. If you know that you won’t be riding for a while, aim for 50% charged to reduce stress on the cells. 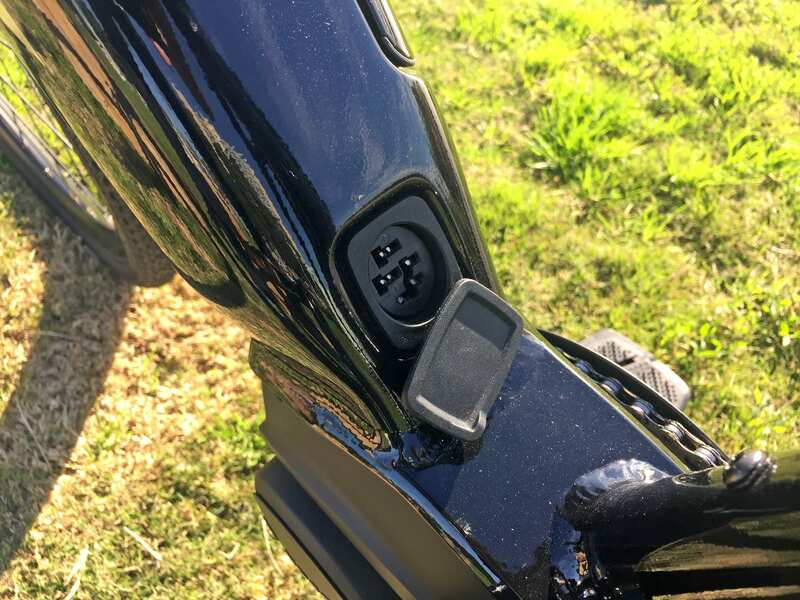 When you’re ready to ride and the battery has been charged and mounted properly, simply press the power button on the top edge fo the Bosch Purion control panel. 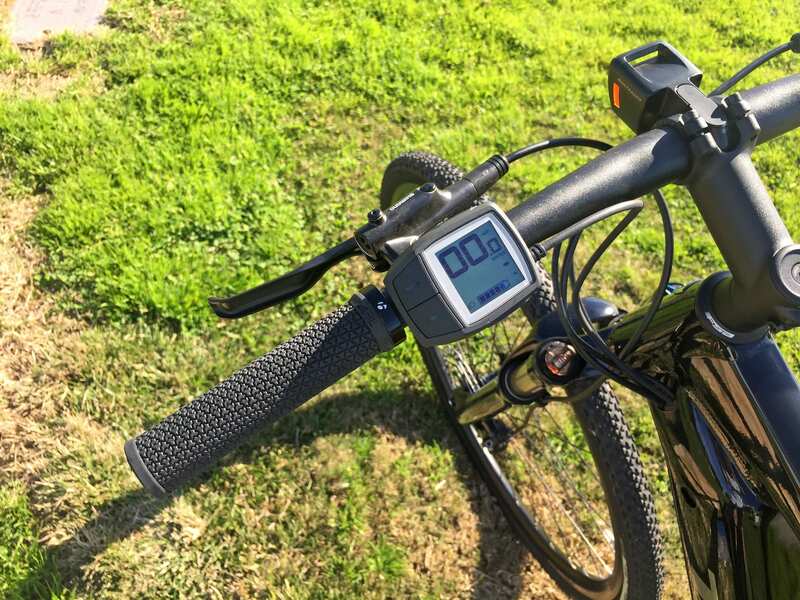 This display is mounted within reach of the left grip and features two main buttons, plus and minus, for raising and lowering the power level of pedal assist. 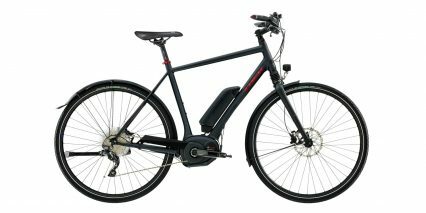 It boots up in Off, so pedaling is just like a traditional albeit heavy bicycle, and you go through Eco, Tour, Sport, and Turbo from there. The lower levels of assist tend to accelerate more slowly and conserve battery power. A five bar battery infographic communicates charge level in 20% increments but there’s actually a range estimator menu that is much more precise. To navigate to this menu, simply hold the minus key for a couple of seconds. If you hold it again, you’ll find the Trip Distance and Total Distance (odometer) readouts. Note that you can reset Trip Distance by holding the plus and minus buttons simultaneously. As an aside, you can ask any Bosch Certified dealer to change a software setting that allows you to turn off the integrated lights, and this will let you hold the plus button to turn off or on. 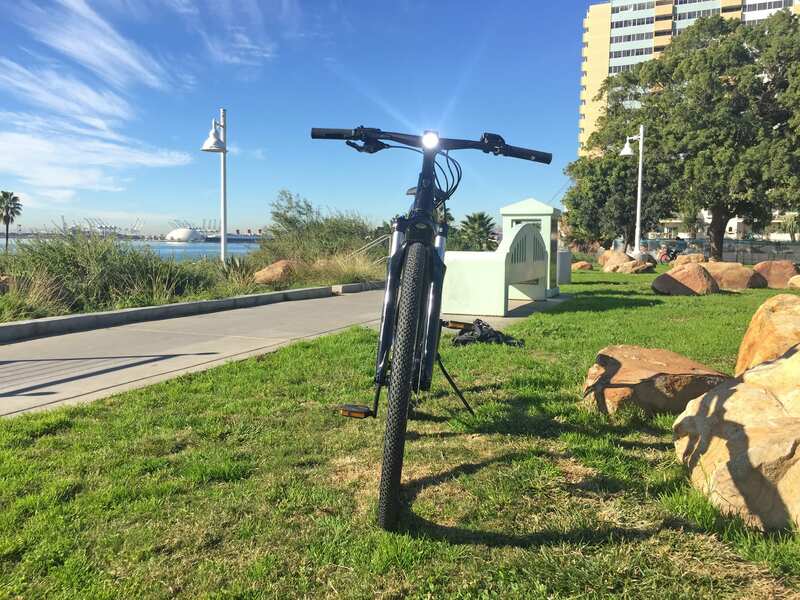 By default, my Trek Dual Sport+ demo bike had the lights constantly enabled and it sounds like the headlight has a sensor to run in flashing mode during the day and constant at night. This follows automobile lighting design with Daytime Running Lights (DLR) as a safety measure. Dealers may also be able to activate walk mode, which is initiated by navigating to one of the assist levels, pressing the button on the lower edge of the display, and then holding the plus button for gentle ~4mph motor activation. 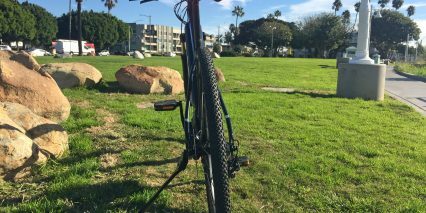 In my experience, it can be handy if you get a flat tire or decide to walk across grass or rough sections of trail. The 1.7″ LCD display is constantly backlit with a faint white glow, provides good contrast with monochrome readouts, and shows your current speed at all times. 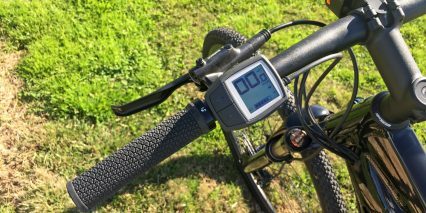 You can cycle units from miles per hour to kilometers per hour by holding minus and tapping the power button when the display is turned on. As cool as it is, there are some compromises with the Bosch Purion. It’s not as large as the Bosch Intuvia, and it’s not removable. You may be able to swivel the display to reduce glare. Despite the inclusion of a Micro USB port built in to the right edge of the unit, this is not a functional charging port… merely a diagnostics and software update connection point. Furthermore, the Purion does not show your average speed, max speed, trip time, clock, or shift recommendation the way that Intuvia does. I have found that the plus and minus buttons are also a bit less consistent to press (aim for the right edge vs. the lower left or center because they pivot in towards the right). Some shops have told me that they will upgrade to Intuvia for $200 per customer request, but that might not work with the Dual Sport+ because it could block the headlight. 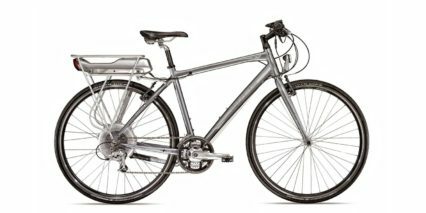 The Trek website communicates that the headlight and stem have a mount for bike computers and additional lights on top, which is cool. I definitely want to compliment the headlight placement here, because it’s high up, points where you steer, and isn’t going to bounce around like many suspension arch mounted lights. For those who are interested in flattening hills, enjoying rides through the neighborhood or city without sweating or falling behind friends or partners, and those who want a platform that is on road and light off-road capable, the Dual Sport+ truly fits the bill. 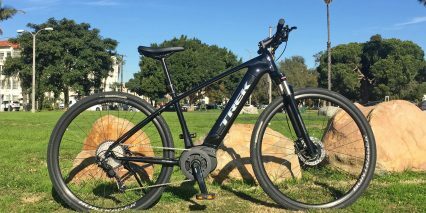 It’s an electric bike that is easy to seek out and test ride at local Trek dealers, and purchase in the correct size. Yes, you’re paying a bit more for this product, but it will last. 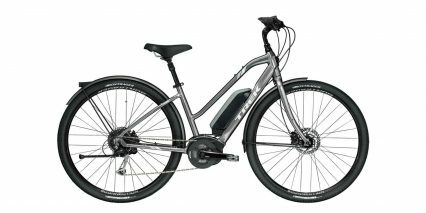 Bosch has consistently been a leader in the global electric bike space, and they support their products for 10+ years (in terms of parts availability) while offering a two year comprehensive warranty. This is a name brand bike company partnering with a name brand motor manufacturer, and they are two of the most reliable in my experience. I’m saying all of this because I have encountered some price sensitivity and question around this model, especially since it increased from the last generation. A couple of other little mentions before closing: the rims have reflective branding stickers on them to stand out a bit more in dark conditions (this follows Trek’s ABC’s of awareness/safety: always on, biomotion, contrast), the wheels do not come with quick release hardware, I really like the battery charge port cover on the frame because it won’t position the plug in the path of the crank arms and it won’t get lost easily thanks to a little leash, the included 4 amp charger will charge the bike faster than average and isn’t especially large or heavy, you can get Bosch Certified Trek dealers to activate walk mode and allow for lights on/off if you want (which is what I did for this review). 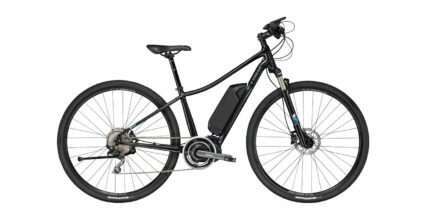 As always, I welcome comments and feedback below, and I welcome you to engage in the Trek electric bike forums by posting your favorite accessories, sharing pictures, or writing your own ride test/review for others to see. Thank you! I just bought this bike last week! I LOVE IT! The review is very accurate. One thing I should mention–the step-through frame is only available in the smaller frame sizes, which was a bummer for me. I tried to fit a medium frame (the largest size available in a step-through), but had to move up to a large frame because I have a long inseam and a long reach. At first, I wondered about the control unit–it seems very basic–but I’ve come to appreciate its simplicity. It is very easy to see, and the buttons are very easy to reach and manipulate while riding. I like the gearing on this bike, too–I feel like I am in control of my workout rather than the bike being in control. I added fenders because I plan on riding year-round as well as riding some packed trails. I also added a rear rack and a tail bag (it does not interfere with the light on the back of the seat). 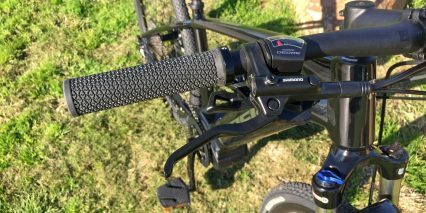 I love the comfort grips, which the bike that was reviewed did not have. It is surprising how a small extended pad on the end of the grips makes such a difference. Be sure to test-ride a bike with these. I plan on adding a rear-view mirror soon. Trek’s extensive network of shops was a big influence on my decision to buy this bike instead of others. I am not a “shredder” or a racer — I ride for enjoyment and exercise. The Trek staff at the two stores in my area treat me like one of the family anyway. When I bought this bike, I had them tune-up an old Trek road bike I haven’t used for at least six or seven years. (I’ve been riding motorcycles instead – ha!) They were just as happy to work on the old bike as they were to sell me this awesome new ebike. This is a great review, and a really awesome bike! Hi Lidja! What an awesome comment, I loved your feedback about sizing (yes, the mid-step is only available in the three smaller sizes while the high step gets three larger), and also adding fenders, rack, and a mirror. 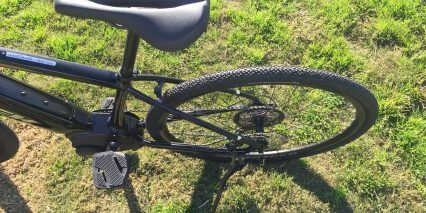 Good ideas for safety, and I like how Trek offers a wide range of accessories at their dealers that will definitely fit and look good. They often help install them too, which helps make it easy. Your comment about the gearing is spot on, I think the Active Line Plus motor feels natural and with the 10 gears you can get a workout and enjoy riding a bike with different feelings of support but not overwhelming… or loud ;) thanks again, I hope it works great for you and I welcome future comments and feedback as you enjoy it for years to come. Thanks for calling this out, Rich. 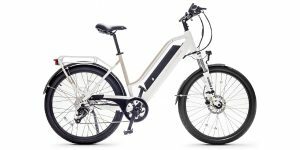 I’ll keep an eye out and try to review the Story E-Bikes, I just visited their website and was impressed with the giving program. Very cool! Hi Dave! You bring up some good points. Maybe I can clarify a few points and try to help with expectations around the throttle and brake inhibitors. 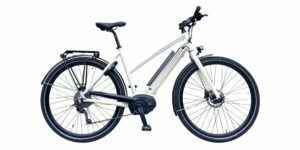 This is a Class 1 electric bike, which is allowed on more trails and bike paths, they are not allowed to have throttles. In fact, no Bosch powered electric bikes have throttles, it’s part of their goal to make ebikes usable and legal in more places. Instead, they have designed one of the most advanced motor controllers that measures rear wheel speed, pedal cadence, and pedal torque over 1k times per second. It starts very quickly and can feel almost like a throttle when used in the highest levels of assist. As for motor inhibitors, they have never been included on any Bosch mid-drive setup because their sensors are so good, it’s not required when you don’t have a throttle and when the sensors are advanced vs. a more basic 6 or 12 magnet cadence sensor only. This allows companies to use nicer brakes, choosing from a wider range of options that are lighter, less prone to electrical issues and complexity, and often times higher quality. 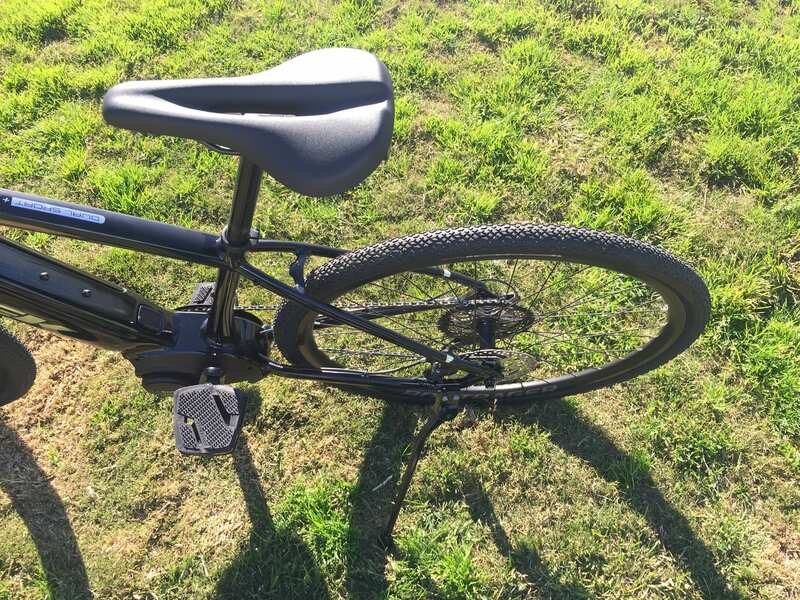 You’re correct that it does not come with fenders, this is likely an up-sell for Trek and designed to keep the MSRP of the bike itself cheaper and save on waste… not everyone needs fenders, but at least this ebike has mounting points to add them easily later. All of this said, I do think the bike is priced high and I see where you’re coming from. 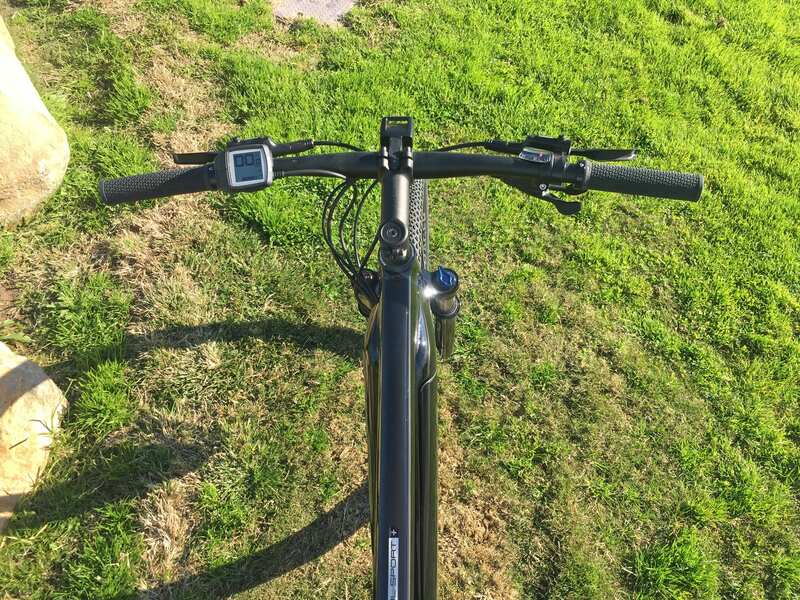 There are many companies that do sell ebikes with throttles and fenders by default. 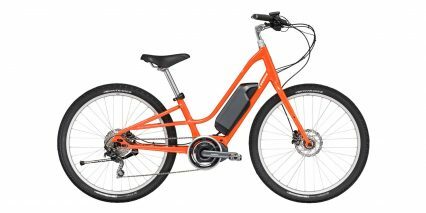 Check out the Electric Bike Company that has a nice cruiser with a hub motor or Pedego that has one with a mid-drive from Dapu vs. Bosch. In your review you say the wheels do not come with quick release. Is that an available option? I would like to pull a dog stroller on some of my rides if that is possible. I am assuming it would be a real hassle to install the stroller if you did not have the quick release wheels. I will be a first time buyer and your reviews have been extremely helpful. Hi Kevin, I think this is a positive reflection of the value that Trek is offering with their products (especailly the Dual Sport+) this company has a massive dealer network and is a leader in the industry right now (in my opinion) so that’s all good except maybe they just didn’t order enough stock this year. I hadn’t heard that they were all sold out? Did a local Trek dealer tell you that?